Formerly named Cassia marilandica, this shrubby wildflower is now known as Senna marilandica. This species’ natural habitat ranges from the Midwestern and Southeastern United States. A tall plant with heights ranging between 3-6 feet, this would be a great addition as a border to any flower garden with full or partial sun. Wild senna blooms August through July with a beautiful yellow cluster of small petals. At the end of their bloom, the senna flower bears a seed pod which turns black in the fall. Senna prefers well-drained medium moisture soils that are loamy, sandy or rocky for best growth but is tolerant of clay soils. The flowers often attract bumblebees who collect pollen and help to cross-pollinate. 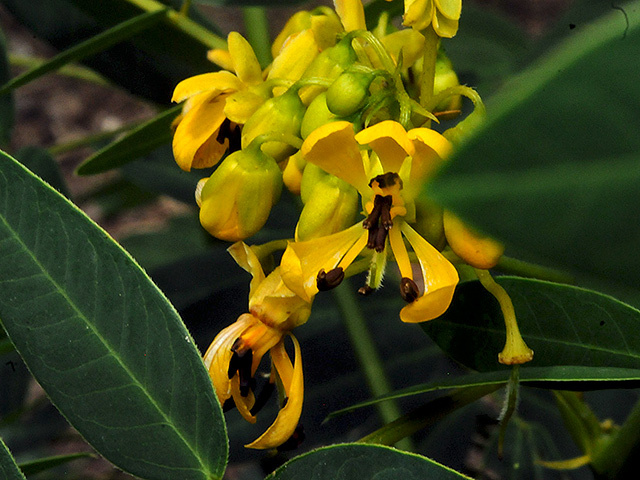 Wild Senna is the host plant for Sleepy Orange, Cloudless Sulphur, Little Yellow butterflies.